��� Lonesome Dove is one of the best Western stories ever told. When it was converted into a 6 hour mini-series by CBS in 1989, it was a massive success. This was due in no small part to the way in which Larry McMurtry could tell a tale and draw readers into not only the story but more importantly the characters and their strengths and weaknesses. This is truly a remarkable piece of storytelling, with a depth and clarity that is rarely seen today. ��� The novel Lonesome Dove was written in 1985 and Dead Man's Walk, the feature of this particular review, did not come along until 10 years later. 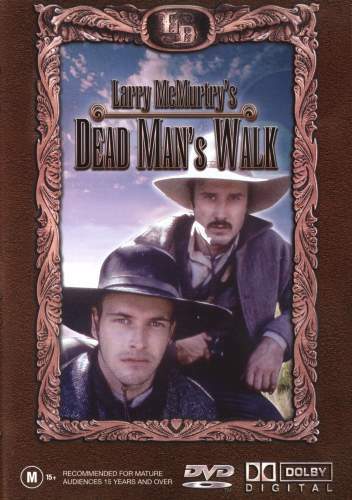 In fact, Dead Man's Walk tells the story of the two main characters of Lonesome Dove, Gus McCrae (David Arquette) and Woodrow Call (Jonny Lee Miller) and their early adventures, and offers some good background information on how they became Texas Rangers. This actually provides a good stepping stone to Lonesome Dove, where the two are since retired from the Ranger life and are convinced by an old friend to head off on a 2,500 mile journey to move a herd of cattle to the Rockies. The journey the men take in this movie is no laughing matter either, and the title is a good indication of the conditions and torment that are to follow. ��� In this 3 part series, young Rangers Gus and Woodrow set out to tame the Texas territory and this is the tale that will take them all the way down to Santa Fe. Along the way they they face impossible odds with everything from mother nature to their own group turning against them at every turn. From a safe distance, a group of Indians lead by Buffalo Hump steal their horses and kill the group one by one. Legend has it that this Indian is the meanest Comanche on the plains and he has taken 1000 captives already. To survive, Gus and Woodrow must rely upon and put absolute trust in each other or they will fail to make it to the end and return back home. There is a strong supporting cast along for the ride with the likes of Jennifer Garner, F. Murray Abraham, Brian Dennehy and Keith Carradine. A special mention needs to go to Eric Schweig who plays Buffalo Hump and is one major source of trouble for the group. His character was played with such ruthlessness that I never would have gone out into the Wild West knowing there were the likes of this character getting around on horseback. Hold on to your scalps! ��� The power of this story is incredible, with good depth given to each character and set at a pace which makes it even more believable. The manner in which McMurtry has portrayed the Indians also makes the show more believable and the typical Hollywood gloss is removed to give viewers a more natural production. At times you will feel this is a true story rather than a remarkable tale. Because you are drawn into each character so well there is a real sense of loss when any meet their fate. This is a must-see for everyone regardless of your genre likes and dislikes. ��� The transfer is presented in its made for TV Full Frame aspect ratio of 1.33:1. Therefore it is not 16x9 enhanced. ��� The transfer has a mild softness to the image, particularly in background or distant objects. Some of this could be attributed to a heat shimmer, but due to the consistency covering all hours of the day during filming I would suggest this is a trace inherent in the source material and not caused by any transfer issue. Foreground objects are sharper and contain clean detailed edges. Shadow detail is very well handled except at 43:50 (Part 1), where detail is considerably less than the rest of the film. This appears to be deliberate to keep you guessing as to some of the action and keep you on the edge of your seat a little. The whole film has an immaculate attention to detail so I fail to see this as anything but intentional. Everywhere else there is a decent amount of detail even when there is little light. There is some low level noise. ��� The colours were typical of a Western where things are deliberately muted. The ladies dresses and the Mexican guards clothing do have some bright splashes of colour but for the majority it is plain clothing in dark shades. The sky at 47:03 (Part 2) was a perfect shade of red, true to the way I would expect to see it naturally. ��� There were no specific MPEG artefact issues with this transfer. At 45:05 to 45:12 (Part 2), my Loewe TV spuriously auto-detected a widescreen signal and switched to 16x9 mode before converting back to 4x3. Aliasing is very rare with examples at 40:33 (Part 1) and 9:59 (Part 2), both barely noticeable when it does occur. Film artefacts are common but quite small in size and not too distracting except at one point during Part 3 from 8:04 to 8:37. There is a small hair that "dances" around the bottom of the screen and is slightly distracting. There was a blue dot at 2:25 during Part 2 which appears next to an actor while talking. It's the size of his eye and because it was level with his neck it was quite noticeable and distracting. ��� Disc 1 is a single sided dual layered disc (DVD-9) with each episode split evenly on each layer so therefore there is no layer change during episodes. The second disc is single sided and single layered (DVD-5) and therefore there also is no layer change. ��� There is only the one audio track on this DVD - English Dolby Digital 2.0. ��� The dialogue was clear and easy to understand at all times even with the deep drawl that some of the characters had. Audio sync was not a problem at all with this transfer. ��� The musical score by David Bell is a good fit for the series and certainly provided a nice accompaniment to the on-screen visual goings-on. It has a nice flow and the music fades in and out regularly to great effect. The volume levels did not drown out the dialogue at any point during the movie and were perfectly balanced. ��� There is no surround encoding on this track but the way the music and effects came from the front soundstage I actually got out of my chair to check this. I would have sworn that there was some encoding as there seemed to be an additional depth to the music, but on careful inspection this was not the case. Nonetheless, the fact remains that the soundtrack was good. ��� There is no specific subwoofer channel provided by this soundtrack. There is a noticeable amount of bass from the main channels anyway so the sub's absence was not really noted. ��� The menu design is themed around the movie and it is also Full Frame like the main feature. The main menu features an animated clip from the movie and Dolby Digital 2.0 surround-encoded audio. ��� This is of similar quality to the main feature. Both discs contain a copy of the same trailer, being presented at an aspect ratio of 1.33:1 with Dolby Digital 2.0 sound. ��� Again we seem to miss out on some content. The Featurette would have been a worthy inclusion and outweighs the Trailer that has been added to the Region 4 discs. ��� I thoroughly enjoyed this mini-series and will be watching it many more times in the future. Some that have read the book say that the movie lacks a lot of detail but there is not a movie around that can provide all the detail a book can. One specific area which gets a mention is the section where (SPOILER ALERT: highlight with mouse to read) they ride through the buffalo herd for 2 seconds. Apparently that was about 20 pages of reading. ��� The video quality is acceptable and contains few issues. ��� The audio quality is the original soundtrack so this is the best we can expect for the title. A soundtrack produced with more channels would have added very little to what is already provided anyway. The limited channels are used well and to good effect. ��� The only extra is in the form of a trailer. Display Loewe Aconda 9381ZW. Calibrated with Digital Video Essentials (PAL). This display device is 16x9 capable.